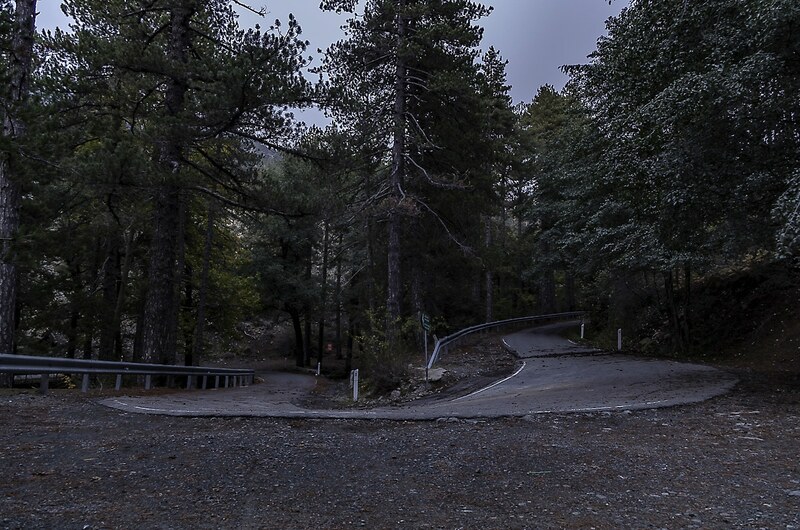 Troodos trails are like a well kept secret in Cyprus. The island is mostly known for the golden beaches and the wild parties of Ayia Napa. Cyprus not only has trails, but also has mountain trails. Yes! It has mountains as well! Located in the middle of the island it will give you great views to all directions and in a clear day you can see all the way to the sea! 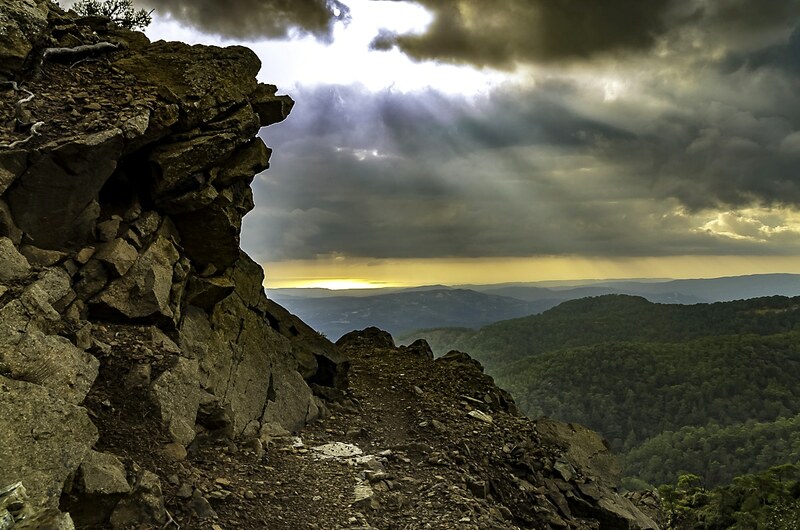 Another great advantage is that you can drive straight to the top by car, so access to the various trails is very easy. It even has 4 slopes for skiing! In general the terrain is easy to cross and so are the trails (if you have never hiked before, you can read our hiking guide). 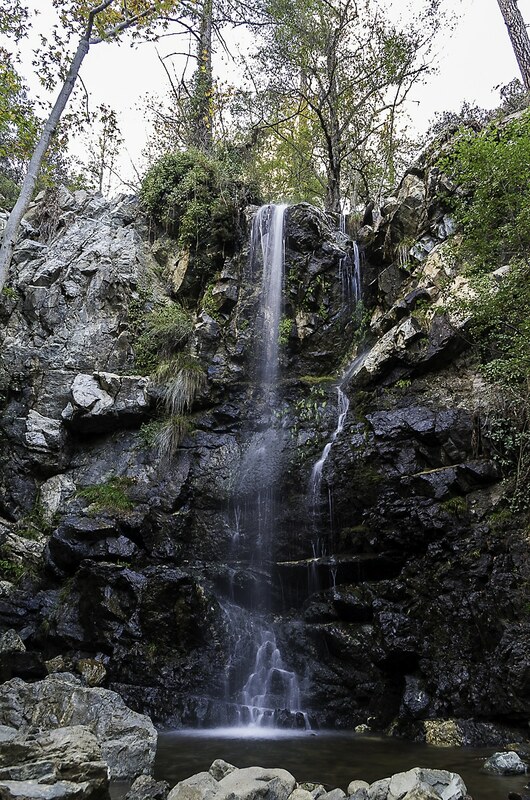 The route I’m writing about here is consisted of three small trails, which together form a circular route which starts and finishes almost at the same place—Troodos square. Another great circular and much easier trail to hike in the area is Atalanti. 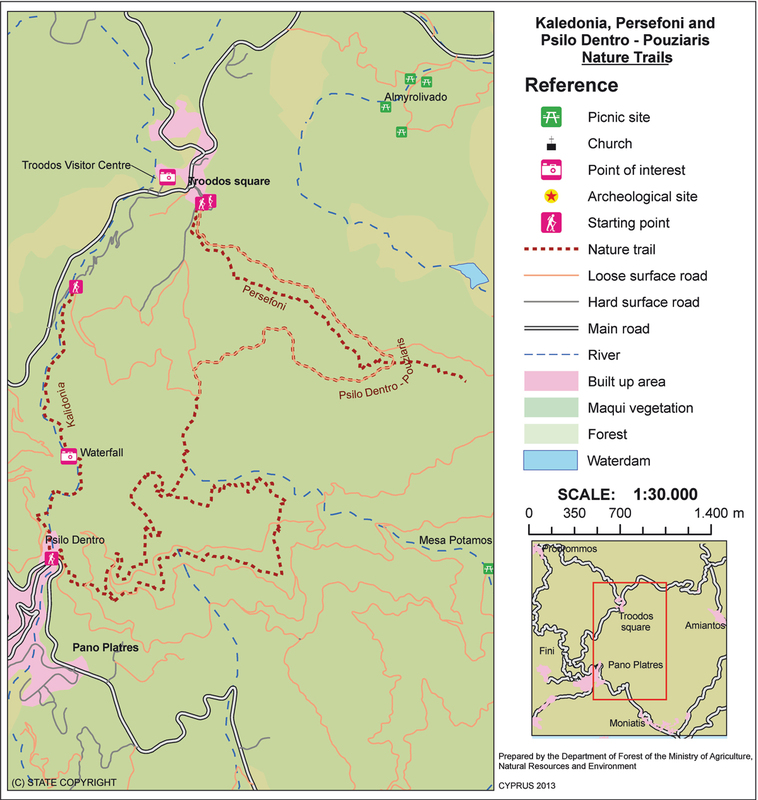 The trails are Persefoni, Psilo Dentro-Pouziaris and Caledonia. Basically the route starts at 1730m where the square is, then goes all the way down to 1238m and finally ascents back to 1700 again. Persefoni is a relative wide and straight trail, so it was easy to walk even with the mediocre signs. It took us less than an hour and it was a carefree walk through the pines and junipers with beautiful views to Amiantos—an old abandoned asbestos mine. Before the trail was over we turned right to the dirt road and walked till we found a sign for Psilo Dentro. Psilo dentro-Pouziaris trail was a little more tricky, firstly because the signage is bad or non existent and secondly because the trail is kind of circular. And I say kind of, because it’s more like a linear one with an alternate route for a part of it. Anyway I suggest you have a map with you even though the route is easy because of the confusing signs. You can get one for free at any Cyprus Tourism Organisation office. For the record we took the route that goes to the right as you descent. This section took us around two hours and a half to finish with stops for photographs. Pouziaris is more narrow and more trail-like. It also gives you this serene feeling of isolation, the sense that you are far from everything. We didn’t meet a soul for the whole duration and for the better part of the trail there isn’t even a village on the horizon. The weather was great, a little cloudy but perfect for hiking. I can say that it was our favorite of the day plus I got the best photos out of it. The trail finished at Psilo Dentro which is actually a tavern. From there we walked fifty meters up the main road and found signs for the small road going up again to Caledonia Waterfalls. This trail was also straightforward and the only difficulty was the ascent. We just found the stream and walked next to it. Vegetation was very thick around there and because it was getting late, the light started to diminish. 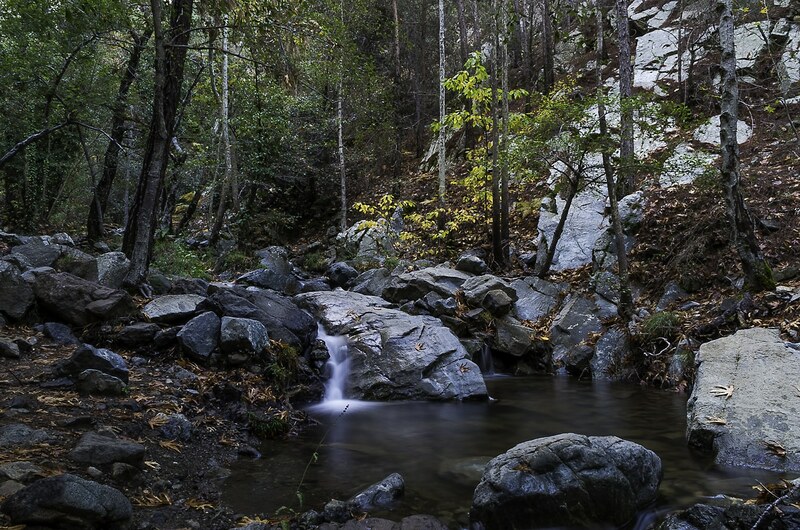 From the nature-lover’s point of view, Caledonia is the most beautiful trail of the three and that’s because water, changes the usual dry terrain you find everywhere else and allows more flora to grow around. Especially species that need lots of water like plane trees. And that’s the reason why this trail was much more crowded than the others. It was getting late and most people were leaving. By the time we reached the main waterfall we were almost alone. We stopped there for a break and to shoot some photos, then carried on uphill through the forest for another half an hour till we found the old B8 snake-like road which goes back to Troodos square. It was night by then, so we walked the rest 45mins in darkness. A pair of walking boots will server you better than sport shoes even though the terrain is not very rough. There is no drinking water till Caledonia so prepare accordingly. It was a lovely hike. 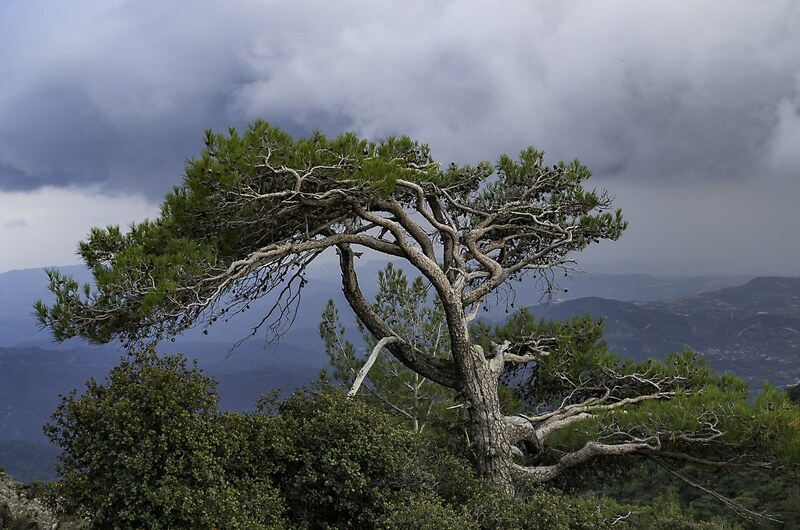 Relative easy with some great views, beautiful pine forests and juniper trees. 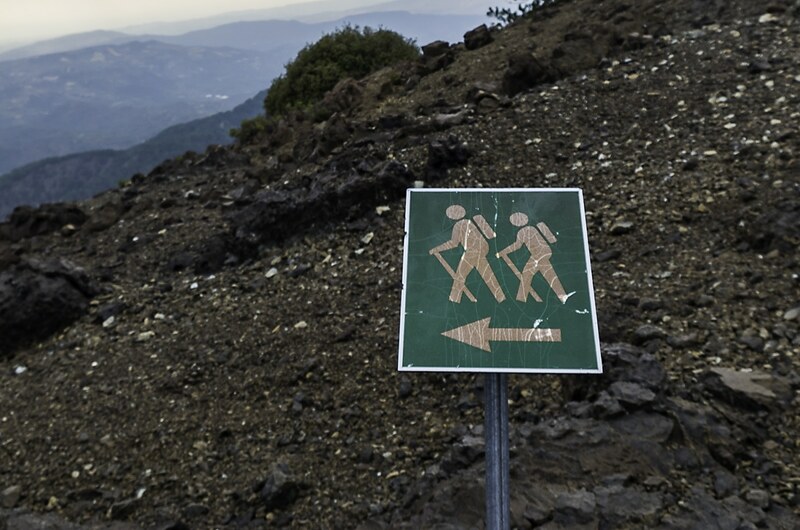 These are really some of the nicest trails on Troodos. All in one this trek can be walked within 6 hours with ease. 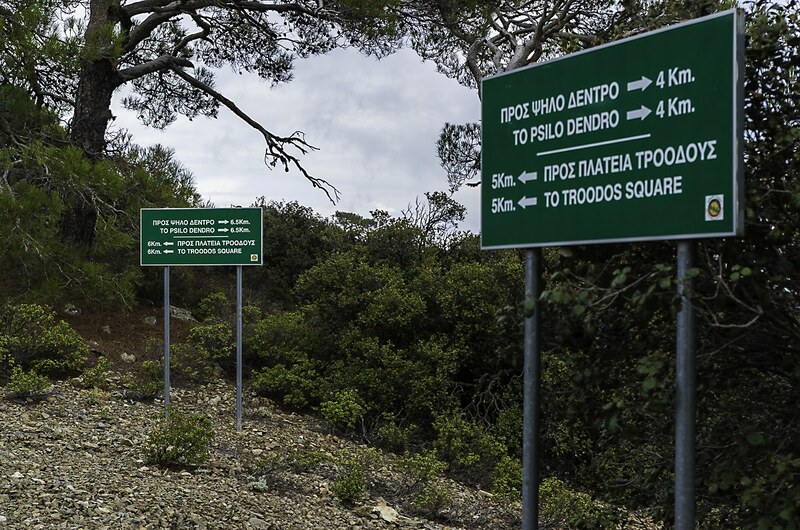 It’s suitable for everyone with moderate fitness level, doesn’t pose any special difficulty at any part of it and is a great way to meet Troodos trails. Helpful for my upcoming trip to Cyprus! My pleasure! If you’d like any other info don’t hesitate to text. If you have a car then you have multiple choices. won’t have any restaurants though. Thank you Chris. 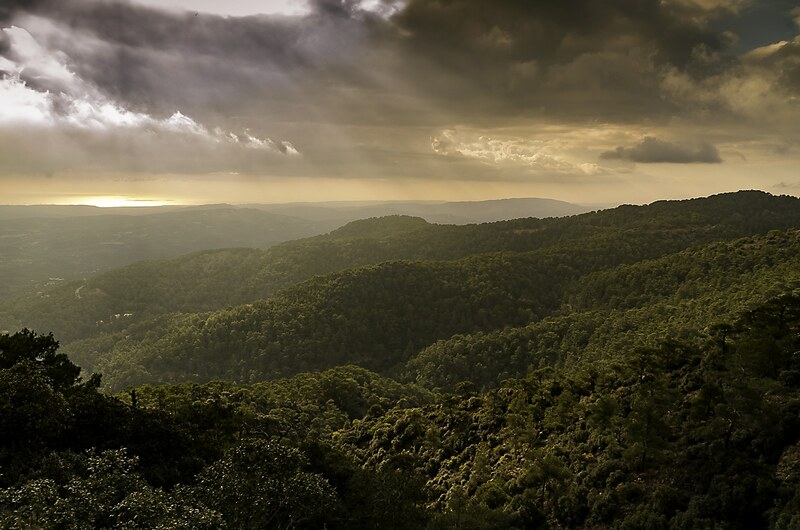 I’m about to travel to Cyprus and want to trek in the Troodos Mountain area while I’m there, so this is very helpful. I’ll have no car so would like to find somewhere affordable to stay, within walking distance of some good trails. I’m used to hiking & staying in hostels but not camping. Any suggestions? Most of the hotels I’m looking at on Booking.com are pretty pricey. Your posts are always inspiring. We are walking Zagoria next year, inspired as we were by one of your past articles. 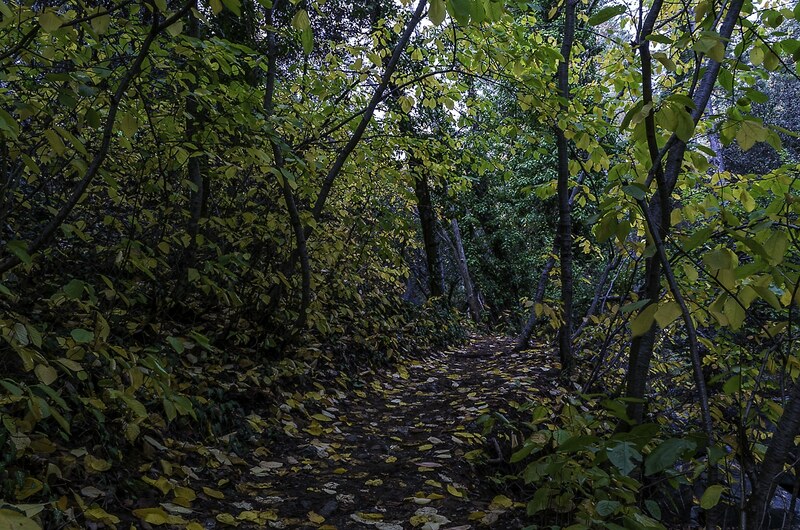 A great way to find out about trails less trodden. Thank you! Zagoria is a place for which I had enormous expectations and when I finally got there, these expectations were met. You will love the place and the people. First of all, the trails themselves are looking amazing and you have done great job with putting the post togheter. I am currently having some issues with finding the connection points between different trails so i would be realy happy if you could send a screenshot of Google Maps. Thank you, glad I can help a fellow hiker. Google maps doesn’t picture the all the trails clearly. Better check this map from Cyprus tourism campaign page.